“Windows PC Repair” is the PUP that uses misleading techniques to prevent removal. Use Reimage to locate malicious components and get rid of them faster than with uninstall instructions. A full system scan blocks virus reappearance and prevents traffic to malicious domains. ”Windows PC Repair” is a fake security warning informing about unknown malware infection. However, this alert is just a scareware used as a shady marketing tool to promote the PC Repair tool. These notifications are typically triggered by an adware program. “Windows PC Repair” virus mostly affects Windows 7 OS users in teh U.S. However, we have received several reports about the same issue on Windows 10 in European countries, including Intaly, Spain, the Netherlands and others. This potentially unwanted program (PUP) usually spreads with freeware and shareware. Thus, it can infiltrate the system silently. Once it’s done, it starts display intrusive ads, pop-ups and causes other browsing-related problems. A few Internet ads here and there do not raise too much concern, but Windows PC Repair ads bring online marketing to another level. And we do not mean that in a positive sense. Thus, allowing it run on your computer can have some serious consequences. Don’t fret; you probably will not lose your files or have your whole operating system rigged. Nevertheless, this virus may sure embitter your browsing experience. 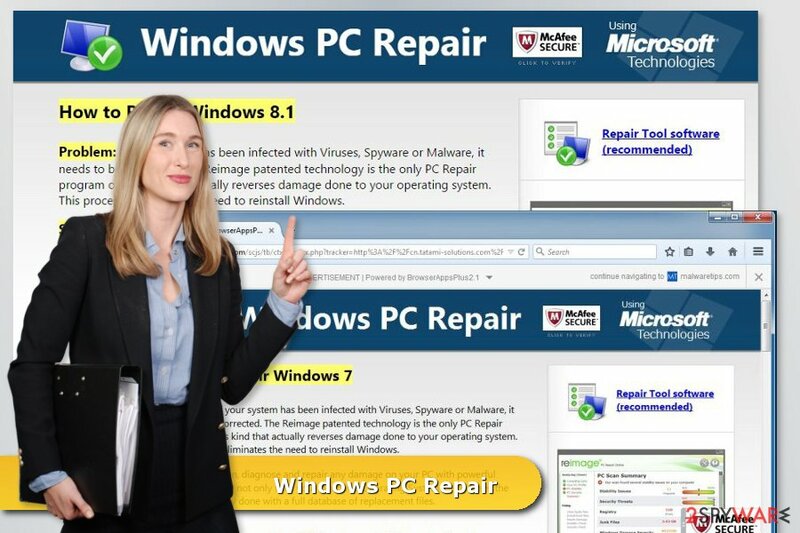 Users complain that windows 7 pc repair keeps popping up and they cannot escape this extensive advertising. Indeed, ads will pop up on random sites, disrupting your usual browsing, overlaying the original content of the websites you are visiting and offering you to obtain various products or services. Some of these offered goods may be purely legitimate, but practice shows that adware developers often include some questionable parties in the list of their affiliates as well. There is always a risk that these parties offer malicious services which can damage your computer, but the Windows PC Repair removal can help to reduce it. Scan your device with Reimage and stop the adware from taking control. 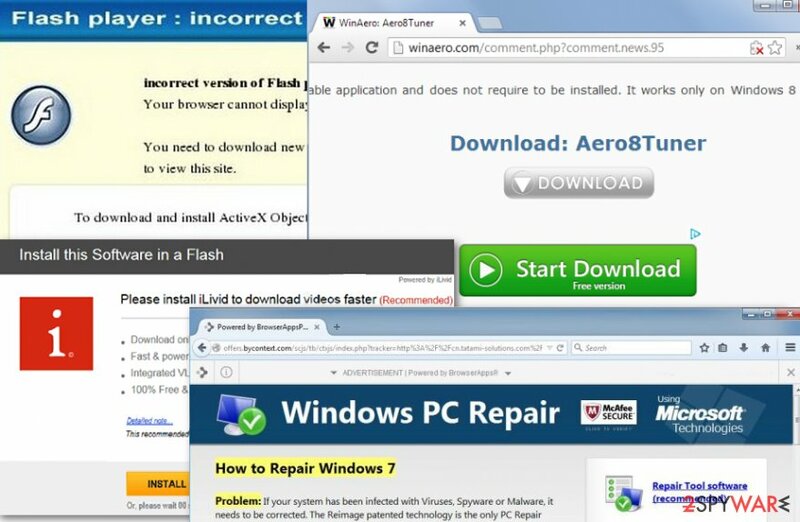 The majority of redirects and ads are designed to trick people into downloading this questionable windows computer repair tool. However, if you would read one or another windows pc repair tool review online, you would find out that this program is useless. It goes without saying that you should not be tricked by this scam and just get rid of the annoying adware. We can assure that you don’t need a help from questionable windows 7 pc repair tool. Ads by Windows PC Repair can be injected on every browser that is installed your computer at the time of infection. Edge, Firefox, Google Chrome and Internet Explorer can also start working really slow and often crash due to the extra load from the multiple ads they have to display. Also, system malfunction can occur due to the poor programming of the virus. But the most dangerous aspect of this adware infection is the Windows PC Repair redirect issue. As we have already pointed out, various software, products or sites can be promoted in the ads this adware generates. But the problem is that instead of transferring directly to a product-related site, the virus often redirects users through completely different domains which can even be infectious. So, you can never know if you will not be offered to obtain some corrupt version of a completely legitimate product. Having all these risks in mind, we suggest the users who are seeing these pop-ups to remove Windows PC Repair from their computers without hesitation. "Windows PC Repair" warns about fake malware attacks and suggests cleaning the computer with a suspicious tool. If you are wondering how this PUP entered your PC, think about your browsing habits. Downloading freeware and shareware applications or watching some ripped movies once in a while might be the source of your problems. Free applications and peer-to-peer downloads are often bundled with potentially unwanted programs because it is probably the easiest way of spreading them around. The malware developers are good at hiding these programs in software installers, so the users do not even have to know they agree to install a potentially dangerous program on their computers. 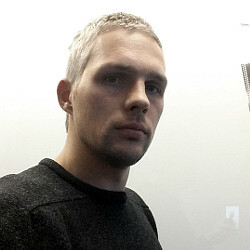 But you do not necessarily have to let Windows PC Repair or any other malware take over your computer. You can stop it on the threshold by opting out its installation via the advanced installation settings. When you run the program, choose “Advanced” or “Custom” modes and install your desired programs safely. If you cannot escape annoying pop-ups and redirects promoting this questionable tool, you came to the right place. Our team of experts have already taken a good look at this program and have created a tutorial featuring several methods which can be applied for the Windows PC Repair removal. These methods are described step-by-step at the end of this article. It doesn’t matter if you got infected with windows 10 pc repair virus or you are dealing with adware in Windows 7, 8 or even XP. This PUP can be eliminated using the same methods. However, if you do not wish to waste your time with this clingy infection which often tends to bounce back to the browser if not deleted properly, have your anti-malware utility to remove it. Select a full system scan option and remove Windows PC Repair once and for all. Here, look for “Windows PC Repair” or any other recently installed suspicious programs. Wait until you see Applications folder and look for “Windows PC Repair” or any other suspicious programs on it. Now right click on every of such entries and select Move to Trash. Check Internet Explorer for virus-related entries. When in the new window, check Delete personal settings and select Reset again to complete “Windows PC Repair” removal. If you suffer from “Windows PC Repair” pop-ups, follow these steps to fix Microsoft Edge. Once these steps are finished, “Windows PC Repair” should be removed from your Microsoft Edge browser. Remove all suspicious extensions from the Mozilla Firefox and reset the browser as shown below. Here, select “Windows PC Repair” and other questionable plugins. Click Remove to delete these entries. Now you will see Reset Firefox to its default state message with Reset Firefox button. Click this button for several times and complete “Windows PC Repair” removal. Here, select “Windows PC Repair” and other malicious plugins and select trash icon to delete these entries. Click Reset to confirm this action and complete “Windows PC Repair” removal. Here, select Extensions and look for “Windows PC Repair” or other suspicious entries. Click on the Uninstall button to get rid each of them. Now you will see a detailed dialog window filled with reset options. All of those options are usually checked, but you can specify which of them you want to reset. Click the Reset button to complete “Windows PC Repair” removal process. ^ Margaret Rouse. Scareware. TechTarget. Tech terms dictionary and technology-related blogs network. ^ ZonderVirus. ZonderVirus. Recent cyber security news for Danish computer users. ^ Shareware & Freeware. Russ Harvey. Russ Harvey Consulting Computer & Internet Services. ^ System malfunction. IBM. The official IBM website. This entry was posted on 2017-08-04 at 01:13 and is filed under Adware, Viruses. You can quickly scan the QR code with your mobile device and have “Windows PC Repair” virus manual removal instructions right in your pocket. How did you remove “Windows PC Repair” virus?